"Give me a tall ship, and a star to guide her by". I wanted that for a long time. No one ever talks about just how hard it is to pick a star. When you wake up and the Carrini star field the view outside your window in the morning—relative morning—it's all too tempting to randomly point one out and decide to see what's there. but for some reason, the bright one down on the right, not quite outside of the nebula field, caught my eye. 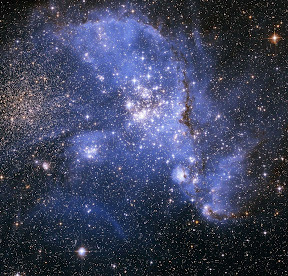 A quick tap on the enhanced window, and the computer displayed the name of the star. I pushed down on the radio button on my wrist. "Navigation." "Wavedrive is primed and standing by." "I want a course Carrini 117A." "Calculating course. We will have to make three wave jumps." The ship began to bank, there was no sense of motion as the artificial gravity kept us centered, but the starfield shifted so that the system I wanted lay in front of the ship. A different set of stars greeted me from this vantage. Someday, I would choose one of those. "Attention hands, this is the bridge. We have Wave creation in 5 . . . 4 . . . 3 . . . 2 . . . 1." "I love my job," I smiled.